Note: This is a Seneca Libraries recommendation. Fig. X. Description of the figure from: "City, Province." Map, Google Maps. Accessed Access Date. Fig. 1. Map of Newnham Campus, Seneca College from: "Toronto, Ontario." Map, Google Maps. Accessed 23 Apr. 2014. Part 1: Lists the original artist's name, the name of the work, and the date the work was created. Part 2: Cites where you found the reproduction of the work such as a book. The example below is for an image taken from a book with a single author. For more information on how to cite books, look at the How do I Cite: Books section of this site. Artist's Last Name, First Name. Title of Work: Subtitle if Any. Year, Location of Work. Book Title, by Author's Last Name, First Name, Publisher Name often shortened, Year of publication, p. number. Da Vinci, Leonardo. Last Supper. 1498, Santa Maria della Grazie, Milan. Great Paintings of the Western World, by Gallup, Alison, et al., Barnes & Noble, 1998, p. 223. Part 2: Cites where you found the reproduction of the work such as a website. The example below is for an image taken from a webpage written by two authors. For more information on how to cite websites, look at the How do I Cite: Websites section of this site. If you refer to the information from the artwork but do not reproduce it in your paper, create a citation both in-text and on your Works Cited list. Da Vinci, Leonardo. Last Supper. 1498, Santa Maria della Grazie, Milan. "The Last Supper," by Harris, Beth and Steven Zucker, Khan Academy, 2015, www.khanacademy.org/humanities/ap-art-history/early-europe-and-colonial-americas/renaissance-art-europe-ap/a/leonardo-last-supper. Accessed 14 July 2018. If you place the artwork in your paper, you must label the figure. The caption should be the Works Cited list citation for the source the figure was found in. For example, if it was found on a website, cite the website. Fig. 1. Da Vinci, Leonardo. Last Supper. 1498, Santa Maria della Grazie, Milan. 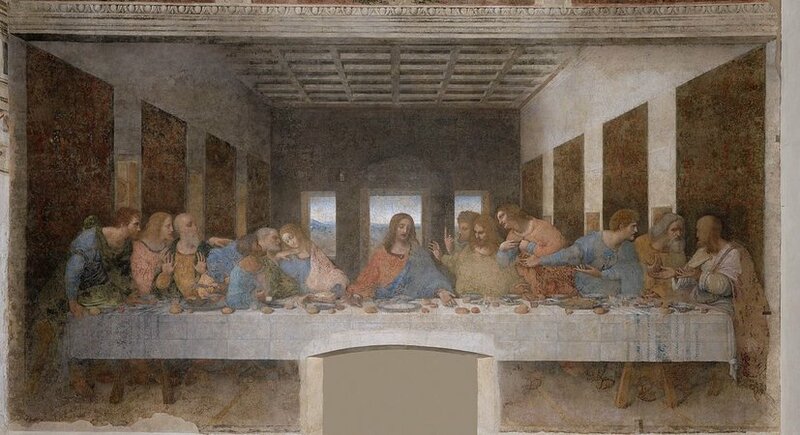 "The Last Supper," by Harris, Beth and Steven Zucker, Khan Academy, 2015, www.khanacademy.org/humanities/ap-art-history/early-europe-and-colonial-americas/renaissance-art-europe-ap/a/leonardo-last-supper. Accessed 14 July 2018.